Health • NutritionTurmeric for Horses ~ Magic or Pointless? Feeding turmeric is one of the latest trends in the equine world. Despite there being virtually no research into the properties of turmeric and the benefits and dangers of feeding it to horses, turmeric users swear by this magical cure. There are two extreme sides to this new feeding craze. The ones who highly recommend it for various lameness and skin issues, and the ones who take the mickey out of the first group. “Oh? It’s lost a leg? Feed it some turmeric and it will grow back in a week.” However, the majority of us fall somewhere in between. Although there has been a bit of research saying that Curcumin, the desirable part in turmeric, has got anti-inflammatory properties. The extent of how effective turmeric is as an anti-inflammatory and how much different size horses would need to see these effects is unknown. There is yet to be any research proving or disproving the other things avid turmeric users swear this supplement can treat. However, many owners have seen differences in their horses since feeding turmeric. It is believed to have helped with; lameness, swelling, arthritis, cancer, immune system and various skin conditions. One of the most popular use for turmeric at the moment is for sarcoids. Turmeric curing sarcoids is not a fact which would surprise me. We still do not know as much as we could about sarcoids and they are notorious for being hard to treat. I think it is also important to remember that the majority of current sarcoid treatments have a relatively low success rate, which often leads to the sarcoids getting worse. Some of you may know that I feed Scottie turmeric for his sarcoids. There are two main reasons I decided to do this. The first is that none of his sarcoids are causing him a problem or in a noticeable area. So paying lots of money on vet fees didn’t seem worth it. The second reason I decided to do this is that turmeric is much cheaper than veterinary treatment and shouldn’t make the sarcoids any worse. Realistically, worse case scenario, the turmeric just wont do anything and I’ve wasted some money. I will be honest and say I am not very good at feeding turmeric consistently. I tend to run out of turmeric or oil and take a while to buy some more. However, these breaks have allowed me to notice subtle differences. Although Scottie’s sarcoids do not get any better when I am feeding turmeric, they don’t get any worse and we don’t get any new ones. Whereas, when I have not been feeding turmeric, we have had a new one or one has got a bit bigger. Yes this might just be a coincidence, but for me, it is a good enough reason to continue to use turmeric unless we run into a problem or research arises about dangers of using turmeric. if you decide to use turmeric for your horse, there are a few important things to remember. The key component in turmeric powder is Curcumin. It is suggested that any powder you feed should have at least about 3-3.5% of this component to be effective. You also have to feed the same – double the amount of oil to the amount of turmeric powder you feed. Choosing the right oil to feed can be tricky. Most people suggest flax or linseed oil. However, both these oils I found very expensive to feed and after finding the following graph, I decided to swap to rapeseed oil. I don’t feed turmeric to encourage the anti-inflammatory response. 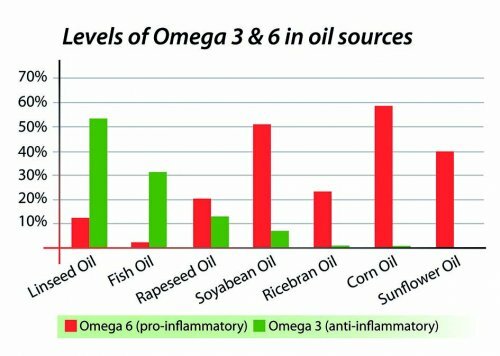 Therefore oils with high Omega 3 were not important for me. If you have a particularly hardy horse, there is the possibility that turmeric and high omega 3 oil could mask minor lameness. However, if you are feeding turmeric for arthritis, lameness ect, then high omega 3 oils are probably your friend! In the end I went with Rapeseed oil. It is very cheap to buy with the majority of your bog standard vegetable oil being 100% rapeseed oil. It is also fairly balanced between pro and anti inflammatory. The last thing you need to include when feeding turmeric is freshly ground black pepper. This is because there is an ingredient in this which helps the body absorb the key components in turmeric. But remember to introduce all these changes slowly. **Edit** I have recently stumbled upon an article written by EquiNutritive who produce a turmeric supplement explaining why they don’t include pepper any why you don’t need to add it. Although I do use turmeric, I don’t see it as a miracle cure. I think there have been enough horses with various problems which have resolved since being fed turmeric to suggest that there is something in it which works. But it needs further research to become a go to treatment. It is a cheap alternative to many other supplements so I might recommend it to certain horses before trying a joint or skin supplement. I would also recommend trying it for horses with sarcoids which aren’t causing a problem before trying veterinary treatment. However, any major problems a horse is suffering with, should be seen by a vet. I would also like to see some research into the long term affects of feeding turmeric. Although I would be surprised if there are any potential dangers, I still think it is something which should be researched.